I always enjoy participating in Stampin’ Celebration’s weekly photo inspiration challenges! I haven’t been able to make something for the challenges over the past few weeks — we were in California visiting my in-laws and some of our friends! I’m so glad to be able to participate for the 20th challenge…and happy there’s fabulous girly inspiration this week! I was inspired by the light pink and black, the girly elements, the quilting and the flowers…here’s my card! I scored the pink cardstock to create a “quilted” background. I used stamps from Lawn Fawn (dressform), Catslife Press (purse), Fiskars (shoes & sentiment). Everything was stamped in Basic Black SU ink. I made the flower by crinkling several scalloped punched circles, cutting a spiral into each circle and rolling them together. A black brad was used for the flower’s center. I cut out leaves from some paper scraps and colored the images in with glaze and glitter pens and colored pencils. Thanks for stopping by…Check out Stampin’ Celebration to see the other entries for this week! Cute! I love that sentiment–so perfect for the challenge too. Thanks so much for playing along with us at Stampin' Celebration! 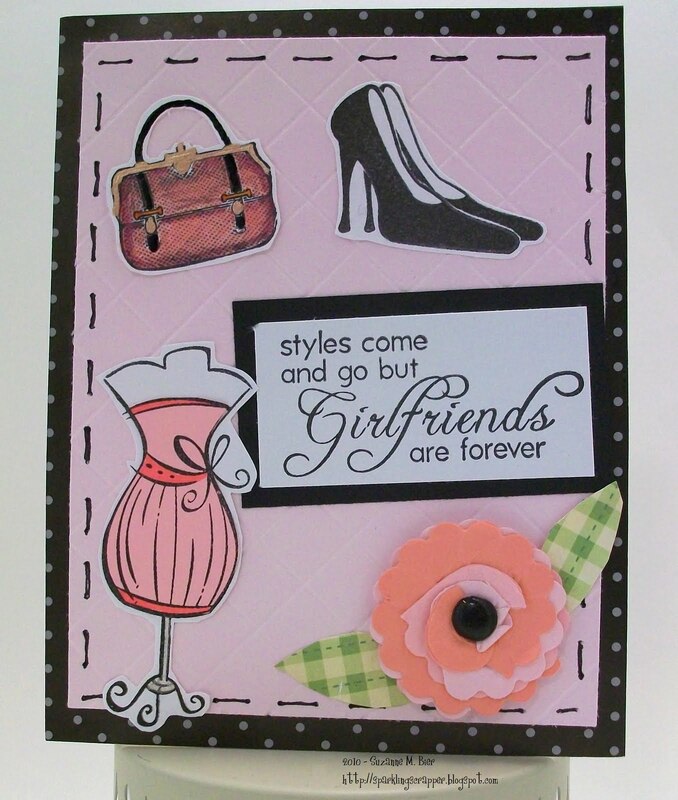 Oh I love the “quilted” background on your card and all the girly things…perfect for this week! What a fun card! I love that sentiment. It's perfect for this challenge. Thanks for playing along with us at the SCIC! !